CONFESSIONS FROM AN ‘OVER PACKER’! Travel light?! What?! Impossible! Well let’s just say it’s impossible for moi! 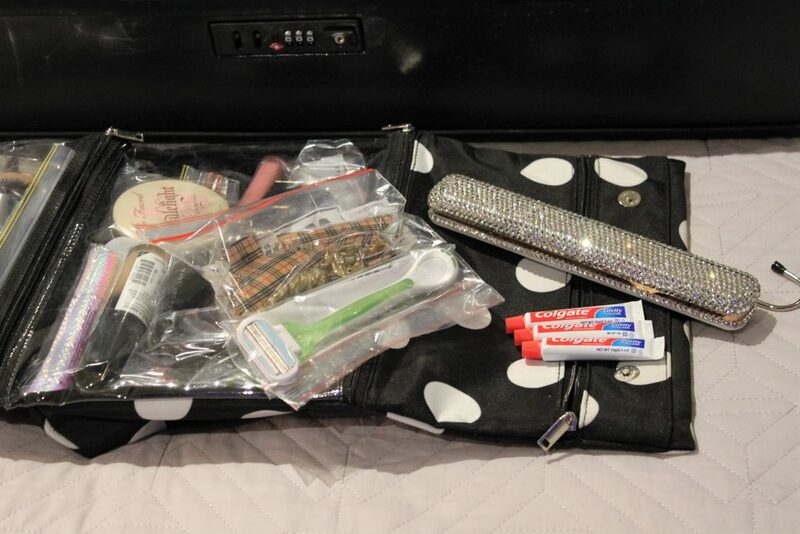 I swear next life I’m coming back as my Husband – he has the art of packing down to minutes and never forgets anything! I love to take holidays but I love them even more if I can take half of my possessions with me! 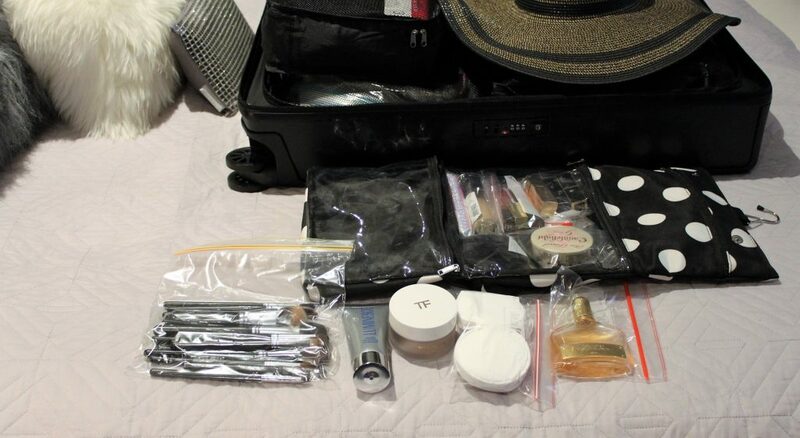 Luggage weight restrictions make things very difficult if you’re even remotely like me – (a self-confessed ‘over packer’) – and I know there’s a few of you out there! I prefer to have all my bases covered, have everything that I need (and then some!) 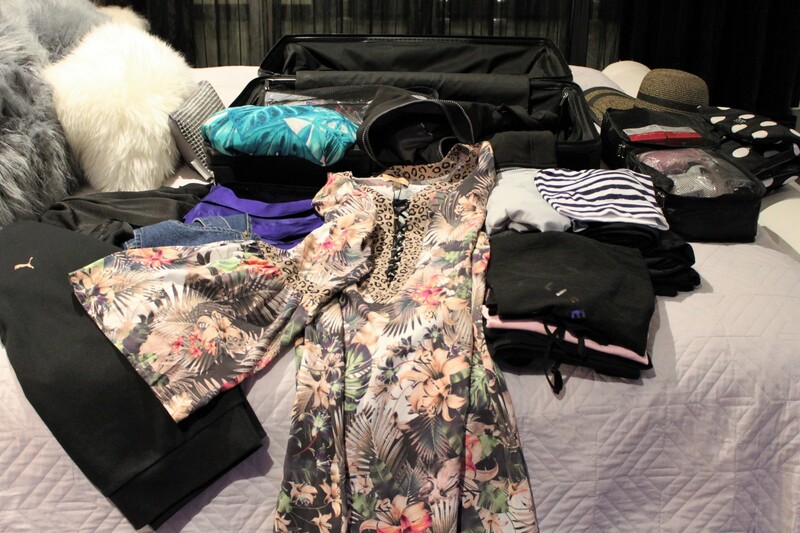 and I like to have choices, but it’s hard to shove all of that into a suitcase! 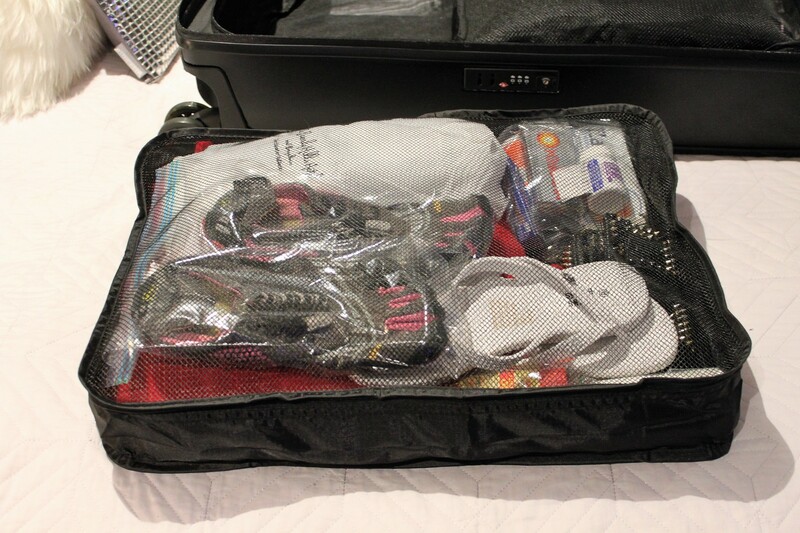 Thankfully, Kmart have a great solution to this packing dilemma – A Set of 3 Packing Cubes for only $9! I am not going to lie to you, I was skeptical! So skeptical in fact, I bought 4 sets thinking I would need all of them …. Let’s just say I have a few sets left over!! Inside this cube I have 10 x pairs undies, 2 x sports bras, a push up bra, 6 X pairs ‘no show’ ankle socks and a pair of Bathers (cross over front one piece $22) – all in that one little cube! Because I had a few sets of the packing cubes, I grabbed another small one and used that for my smaller toiletry items. 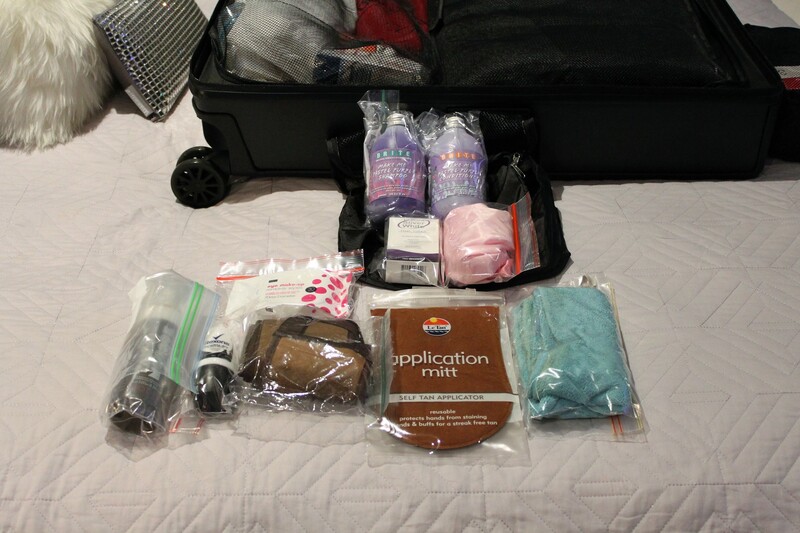 I pack anything liquid in a zip lock bag when I travel – if anything explodes or leaks from the pressure in the plane, it stops the liquid from ruining everything in your suitcase. Inside this other little cube I have a shower cap, fake tan, deodorant, back tanning strap, tanning mitt, hair turban, hair colour, shampoo & conditioner and make up remover pads. Next I’ve used a large cube to pack most of my clothes – options – I need lots of options and choices!! Neatly packed inside this cube I’ve got shorts, longs shorts, casual pants, 3 x T Shirts, a jumper, a dressy jumpsuit, a casual jumpsuit, 3 x Dresses, denim overall dress, a waterproof jacket, 3 pairs sports leggings, (another) sports bra, 2 x Singlets, a beach cover up and an evening dress! 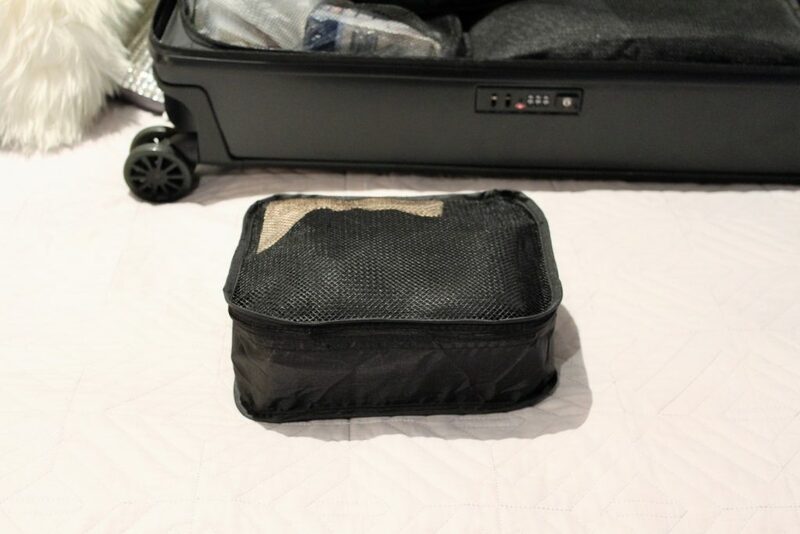 I’ve used one more large cube mostly for my shoes and a few other items that are sealed in plastic so they won’t be affected by travelling alongside my footwear!!! I use shoe bags for all my shoes – I prefer to have them bagged when they’re in my suitcase – it just gives me piece of mind that I haven’t walked in anything gross that could find its way inside my case and, it protects your shoes. In this packing cube I have managed to fit 1 x pair thongs, 1 x pair heels, 1 x pair flats, 1 x pair slides, and 1 x pair toe shoes aaaannnnd I get to wear another pair of shoes on the plane so 6 pairs all up!!! (That makes me smile!!) 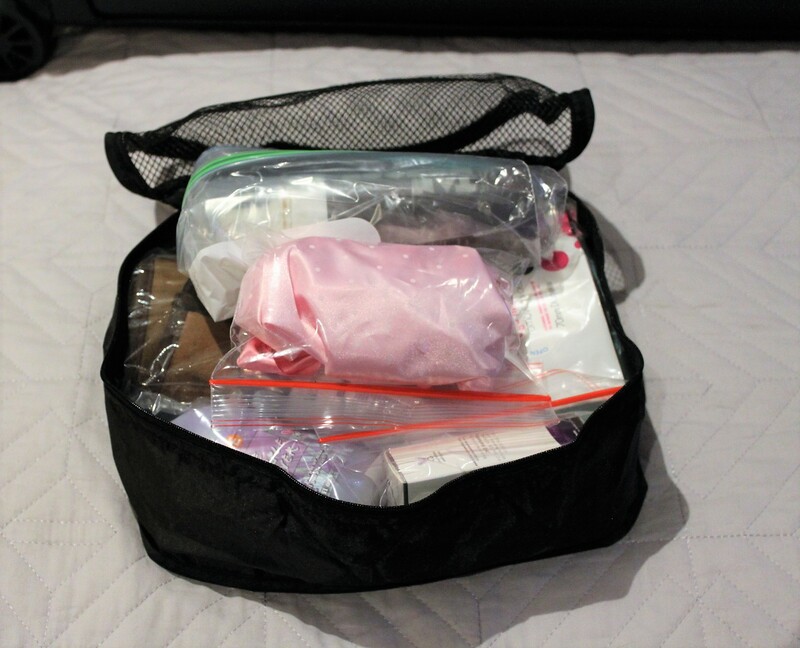 I’ve also packed in this cube my medication, a small handbag, a scarf, lint roller and Sunscreen – for the face and body. Oh, and a pair of hotel slippers which may come in handy! I am amazed at how much you can fit into these things!! They are awesome! 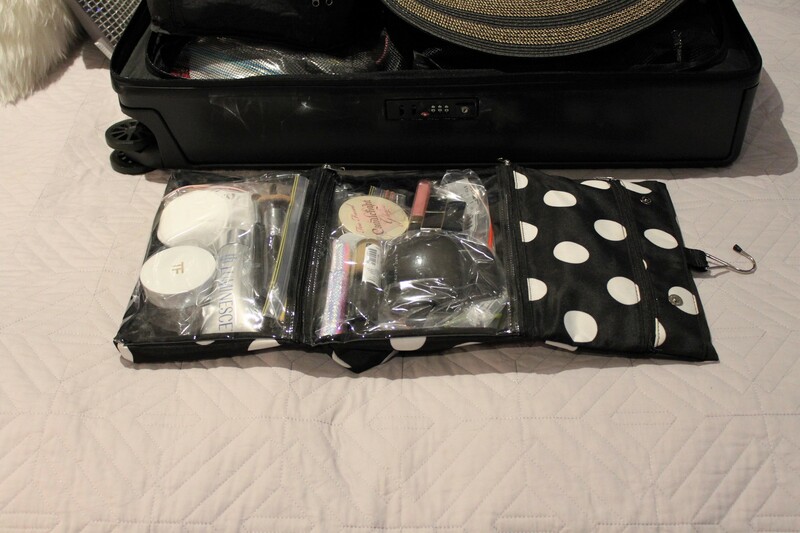 And lastly, I have a large foldable cosmetic organiser – this one isn’t from Kmart, but they do sell one similar for $12. These are brilliant – they hold a ton and if you’re in a hotel and short on space, you can hang them on a hook for the duration of your stay and still see everything that’s inside! In the top zip section I’ve got the White Marble Finish Toothbrush Box $4.50 which I covered with bling for my last trip, some travel sized toothpastes, a disposable razor and two hair clips. In the middle section I’ve got a 16 colour eye shadow palette, a highlighter, mascara, foundation, 3 x lipsticks, 3 x lip glosses, bronzer/powder palette and a blush palette. 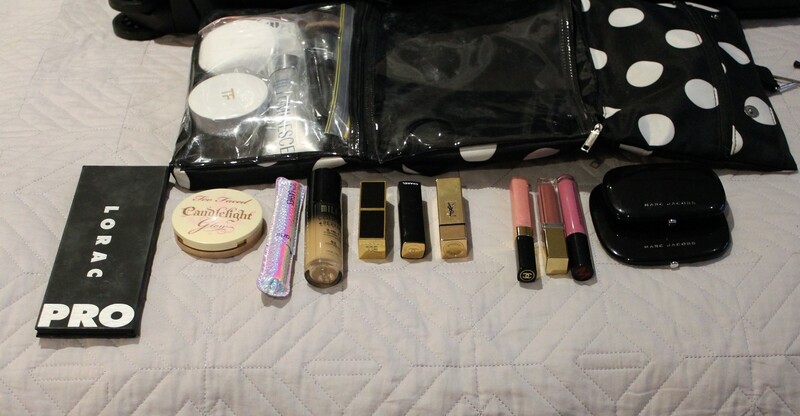 And in the bottom section I have my brushes (18 of them because we had so much room! ), cleanser, moisturiser, make up remover pads and a bottle of fragrance. And there it is – my home away from home all neatly packed with nothing squashed! My suitcase shuts more easily than it ever has before and the total weight came in at 18.5 kilograms! Qantas baggage handlers won’t believe it’s my suitcase!! I love the idea of these cubes – I know where all my things are, they’re easy to access and put back and the best news of all …. I still have plenty of room left in my suitcase so I can shop and buy some more stuff to bring back home!! Before I leave I’m going to confess one last thing to you all …. You’re probably thinking I’m going away for a month … I’m hanging my head and whispering very quietly that I’m not – I’m only going away for 7 days!!! But, a girl’s got to have her ‘things’, right?!! Stay safe and I’ll see you when I’m back from my holiday!